This article is a part of the Carnival of Natural Mothering hosted by GrowingSlower, Every Breath I Take, I Thought I Knew Mama, African Babies Don't Cry, and Adventures of Captain Destructo. This month's topic is Natural Birth Choices. Be sure to check out all of the participants' posts through the links at the bottom of this page. This month I have decided to link up with GrowingSlower's October Carnival of Natural Mothering. That's a mouthful! But all it means is that a bunch of bloggers are getting together to talk about natural birthing (that's this month's topic) and we all get to link up and read each other's posts and support each other... Yay! I'm really passionate about women being informed about their birthing choices. I remember the first time I watched "The Business of Being Born." I wasn't even pregnant at the time and it changed my life. That's when I realized that birthing didn't have to be a scary thing. 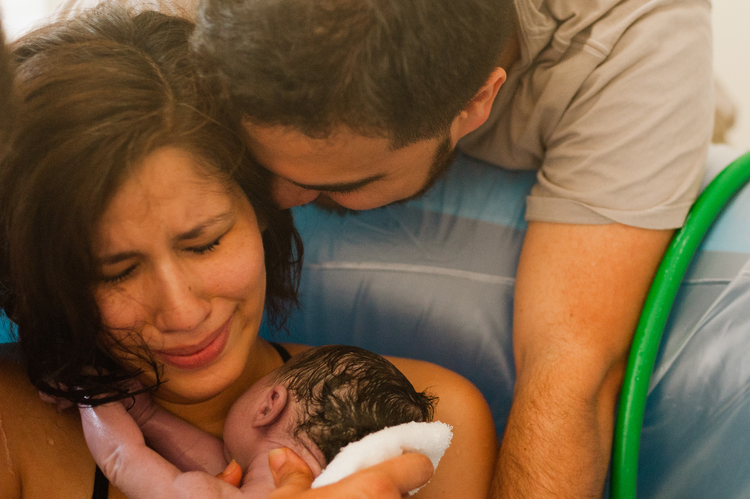 Childbirth could be beautiful and life-changing and amazing. And that's exactly what it was. Liam was born in a hospital in Denver and even though I had every drug available to me, I managed to stay strong (thanks to my awesome birthing team supporting me and the good Lord for getting me through it) . I cried. I couldn't believe I had pushed this little guy out. When I was pregnant with Isabel I knew what my body was capable of and planned a home water birth. It was truly one of the most amazing experiences of my life, especially since she was a surprise breech baby! I'm so thankful for my birthing experiences. I'm grateful that I have had the opportunity to birth my babies with no complications or medical interventions. We're not planning on having any more children and sometimes I get a little sad that I won't be giving birth ever again. No, it's not easy giving birth, especially without drugs! There's definitely that moment in every labor when you think you're going to die and there's no way you will make it through the pain, but it passes and you get to that moment. That moment when you see your baby for the first time. That moment when they're finally out and you can't even feel anything but intense love and relief and empowerment. That moment when you feel the biggest high because you did it...you birthed your baby...and now they're here, they're finally here. Nothing compares.